During his post summit press conference on June 12, President Trump first stated that, “Chairman Kim has told me that North Korea is already destroying a major missile engine testing site,” without specifically identifying which site. 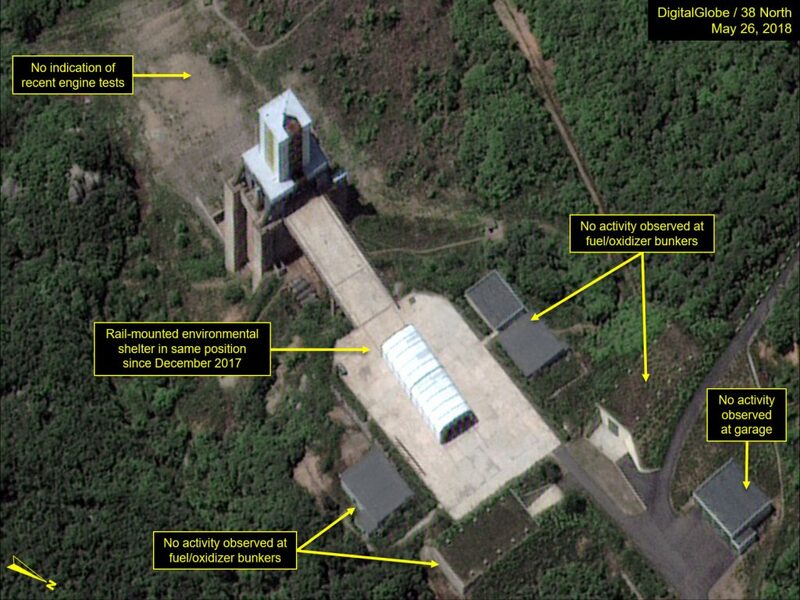 However, a Chosun Ilbo report this morning states that the site Kim promised to destroy is a large-scale facility in Tongchang-ri (Sohae Satellite Launching Station), North Pyongan Province.” While this has yet to be confirmed, 38 North has conducted a survey of the North Korea’s rocket and missile launch and engine test facilities using recent high-resolution satellite imagery and has not yet identified any activity associated with the dismantlement of facilities at Sohae or any other test sites in North Korea. 38 North will continue to monitor Sohae and the other known test facilities for any activity. Figure 1. Sohae satellite launch facility’s vertical engine test stand.